1 1. 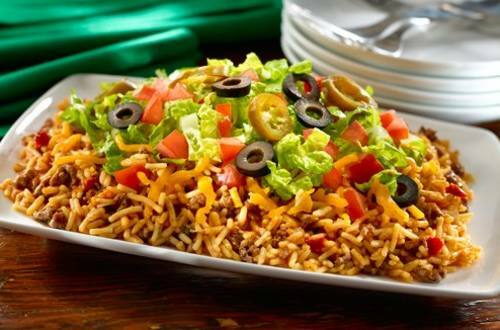 PREPARE Knorr® Fiesta Sides™ - Spanish Rice according to package directions. 2 2. BROWN ground beef in large nonstick skillet over medium-high heat; drain, if desired. Stir in Knorr® Fiesta Sides™ - Spanish Rice. 3 3. ARRANGE rice mixture on serving platter, then top with lettuce, cheese and tomato. Serve, if desired, topped with your favorite nacho toppings such as guacamole, sliced olives, sliced pickled jalapeño peppers and/or sour cream; now it’s delicious. Dig in!